Another fabulous WOW Toys set has made its way into the family, this time along with the My Pocket Pets that I reviewed here, Little Big Man gave Pet Rescue Percy a real test! Little Big Man is Autistic, one of the many symptoms of children with Autism is there obsession with one particular thing and Little Big Man's obsession is for animals, being Autistic, Little Big Man struggles to interact with other children, its very important for him to have his own separate toys away from his baby brother Baby Boo and any other child he comes into contact with, LBM is happy to share any toys with any other child, apart from his animals. 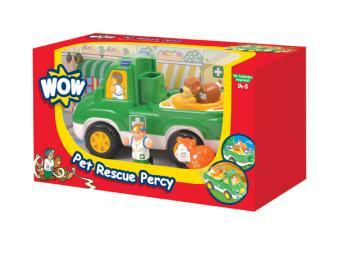 The Pet Rescue Percy set is suitable for 18 months+ and is a 4 piece set, the pet rescue vehicle Percy, the vet Rolf, Socks the cat and Bonny the dog. The set helps with sound to aid development, sensory stimulation & motor skill development, discovery & learning, social interaction and role-play & exploration. Pet Rescue Percy is a motorised pet rescue vehicle, it has a rotating pet feeder on the back which makes low clicking sounds (part of LBM Autism is he hates loud sounds and noises, at nursery he has special ear defenders for when the other children sing and produce other loud activities). Rolfe, Socks and Bonny are all removable from the rescue vehicle meaning your child can play with them with or without Percy. We couldn't get Little Big Man to look up at the camera, he was too busy lost in a world of imagination with his new toy. The set has very detailed stickers, with the help of these stickers, LBM treated his pets with the vet's Rolf medicane and then rotated them to feed them. As with the other WOW Toys products we have reviewed, Pet Rescue Percy is a reliable toy, it's not cheap plastic, the colours are clear and bold and overall they really do appeal to children, the best thing for us parents has to be the fact that no batteries are required! Pet Rescue Percy is available to buy with a suggested RRP of £16.99 from Tesco, Amazon, Enchanted Wood, Play.com to say the least. To find out more about WOW Toys, check out the official website here, find them on Facebook here and follow them on Twitter here.